I believe people learn best when they are actively involved and having fun. Our workshops provide people with a safe environment in which to examine their attitudes and beliefs about conflict and explore new approaches. This allows people to learn from each other, as well as from the facilitator. 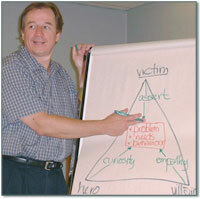 I design and customize these workshops to meet the needs of your specific group. My talks and workshops provide high energy, entertaining and interactive experiences in which participants deepen their insights into conflict and discover ways to manage it. I will provide you and your event participants with an entertaining and enlightening view of conflict, along with specific strategies to resolve it. Although I no longer mediate, I have many associates who specialize in different areas of mediation.